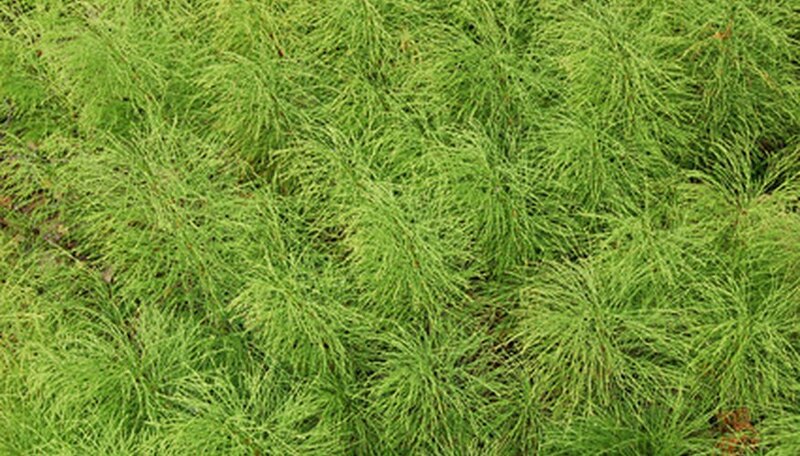 Horsetail weed, also known as scouring rush, can be difficult to eliminate. This perennial weed grows almost anywhere and puts down an extensive root system of shoots and tubers that reach 6 feet into the soil. And because it thrives in areas with ample sunlight, it often establishes itself amongst other, more desirable plants. To permanently get rid of horsetail weed, you must kill and then out- compete the weed for several growing seasons. Remove the horsetail by hand in organic fields by tilling the soil to a depth of a few feet. This will not kill the horsetail weed, but it will delay its re-growth long enough to give it some stiff competition. Collect and bag any rhizomes or roots that you uproot and burn or throw them away. Even horsetail roots cut into tiny pieces will regenerate. Spray horsetail weed growing in wild, uncultivated areas with an herbicide prescribed for use on horsetail such as primisulfuron. If horsetail is growing amongs desirable ground cover, use an herbicide deemed safe for use on perennial grasses such as MCPA. Follow the manufacturer's instructions for application and mixing rates. Plant or re-seed the previously infested area with a competitive ground cover that grows well in your area. This ground cover should be maintained for at least two years to ensure that horsetail weed will not re-establish itself in the area. After that time, you can plant slower-growing crops in the area. Apply a nitrogen fertilizer to the planted or re-seeded area. Nitrogen will stimulate the growth of the ground cover, but not the horsetail. Use a commercial fertilizer prescribed for use on the type of ground cover that you have planted. Follow the manufacturer's instructions for application rates. Horsetail can kill grazing animals if they ingest enough of it.